Another week gone in a flash! Between work, swatching for a couple new ideas/submissions and knitting on other projects, the week just flew by. And because I’m a sucker for a good wedding (or, more accurately, a really good wedding dress), I also dragged myself out of bed at 5 AM yesterday to watch the royal wedding. I loved the whole event and I thought both of the Princess’ McQueen gowns with their corseting, lace, and luxurious fabrics were stunning. I expected that the gowns would be my favorite part of the whole wedding, but once the cameras captured Prince William saying “you look beautiful” to his bride in the Abbey, that was my hands-down favorite. What bride wouldn’t want to be told she looked beautiful in front of 2 billion television viewers? 🙂 Sarah Burton of Alexander McQueen deserves major kudos for the dresses and I’m sure the future of the label is secure for quite a while to come. Coincidentally, the Metropolitan Museum in NYC will also be celebrating McQueen when it opens a retrospective exhibit of his work next Tuesday morning, in anticipation of the Costume Institute’s annual gala. I’ve got tickets to see the exhibit early, so I’m looking forward to another dose of high fashion next week! 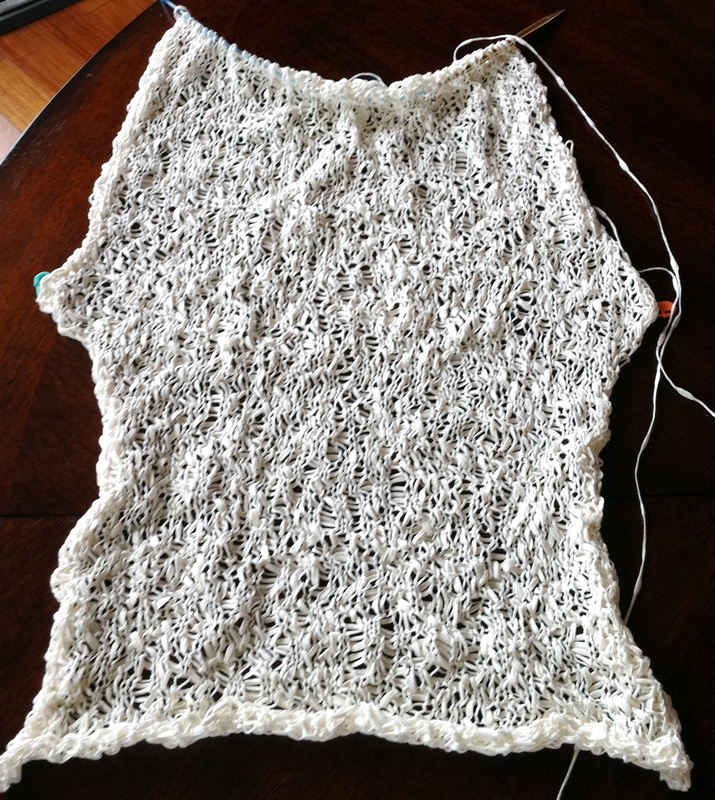 I haven’t washed/blocked the sweater yet, because I always like to try on the finished product to make sure nothing needs to be ripped/reknit before it gets soaked in water. 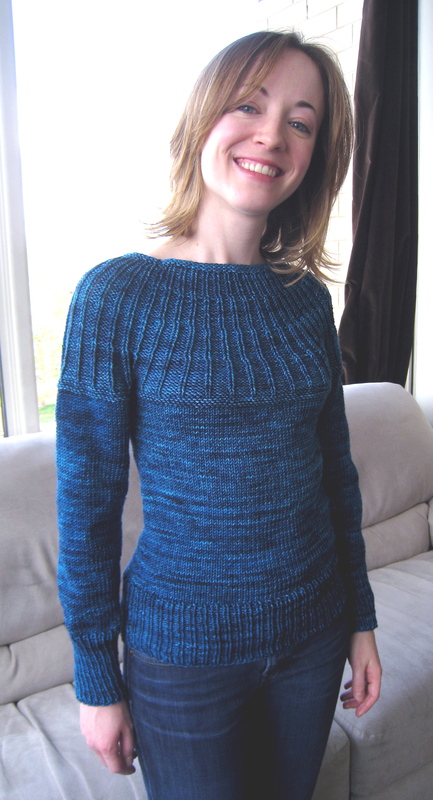 I love this design (the Lapis Yoke by Hannah Fettig) and I’d definitely encourage you to check it out! The only modifications I made were to make the bust circumference smaller (sigh – such is life…) and to make the sleeves longer, as I mentioned before. My knitting on the white Tahki Ripple two-way jacket also proceeds apace, although it still understandably looks like nothing but a pile of knitting and not a garment! Finally, I got word this week that a blanket design of mine was accepted for web publication, which is great! 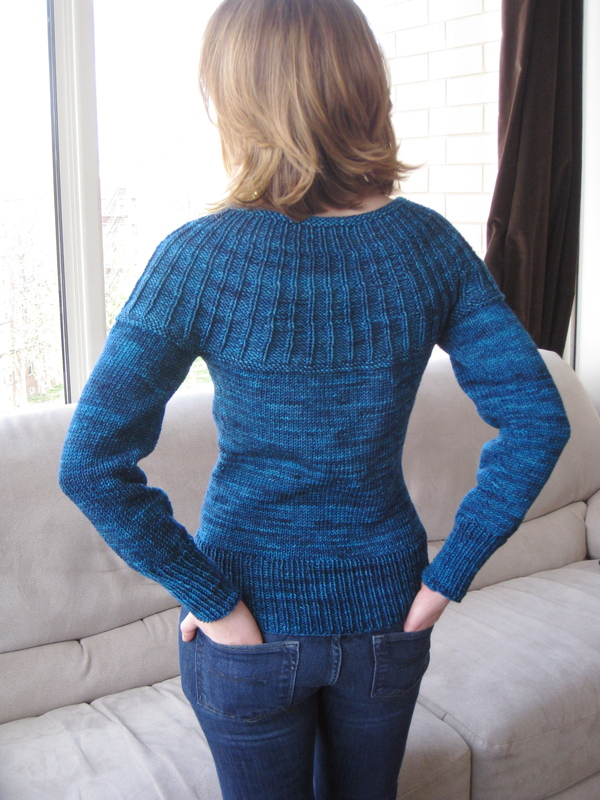 I’ll provide you with all the info on where to get the pattern once the details are finalized. Did I mention that it’s also a crocheted blanket? Sacrilegious, I know, but sometimes the speed and versatility of crochet are just what I’m looking for! Hope everyone has a great Saturday! NYC is still blooming and it’s promising to be a sunny, warm weekend – looking forward to making the most of it! PS: One final tidbit about the wedding gown – I’m a big fan of lace on a wedding gown, since my own was covered in lace. Here’s an amazing article from the UK’s Telegraph newspaper about how the lace of her gown was embroidered by hand – and the secrecy surrounding it!